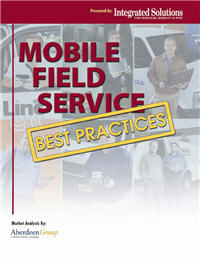 Every year, Aberdeen Group conducts a survey designed to measure the mobile technology intentions of field service firms. The results of this year's study confirm the continued interest of service organizations in providing their field technicians with the required tools to efficiently meet customer needs without the hassles of paperwork or back-and-forth trips to the office. In fact, 95% of firms surveyed indicate that mobility is either extremely or very important to their service operations. Furthermore, 45% of firms indicate that they currently leverage mobile solutions, while another 39% indicate that they are actively evaluating technology options and plan to implement a mobile solution within the next 12-24 months. Clearly, intentions for mobilizing the service workforce and connecting them to critical information stored in the enterprise are quite high.